Markets are soaring, and wealth is growing— but most of the gains flow to people at the top. Technology is transforming daily life, but it is also fostering deep anxiety about the loss of jobs and entire occupations. Cities are thriving as magnets for the wealthy and the ambitious, but rural Americans often feel left behind and resentful. Hostility toward immigrants has become intense, and sometimes violent. Disillusion with government is high, and many citizens are convinced that wealthy interests are hijacking democracy itself. Amid all the dysfunction, however, new plutocrats have stepped up as philanthropists to underwrite social reform. Yes, it sounds like Trump-era America. But these were also the conditions that prevailed more than a century ago, when the Progressive Era generated social and political reforms that made the United States a freer and fairer country. We are not saying that history is repeating itself. But in a saying often attributed to Mark Twain, it often rhymes. As depressing as America may seem right now—just as it seemed to many in the early 1900s—the roots of a constructive and effective democracy are still with us. 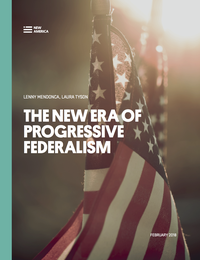 We argue that this is exactly the right moment for a new form of progressivism: progressive federalism.